I might be a total cheeseball, but this year I really wanted to celebrate my dog’s birthday in some small way. 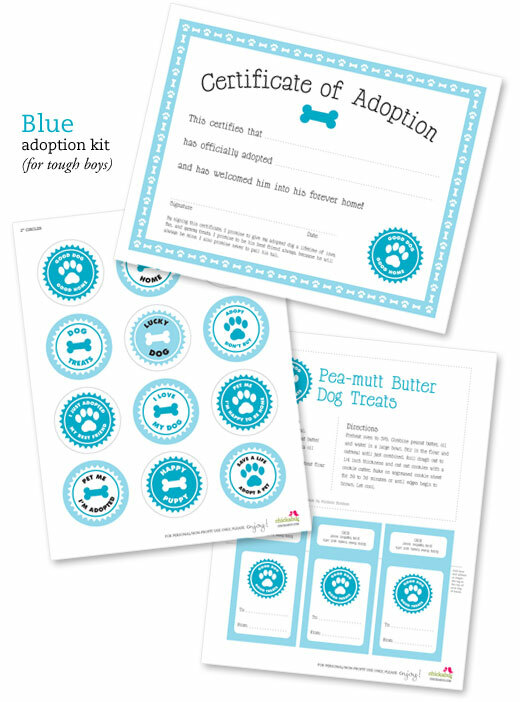 And what better way to celebrate than with a free printable that honors adopted dogs, and the families who adopt them! Since then, she has been by my side at every step – she’s my shadow, and I couldn’t lose her if I tried. She’s a heck of a swimmer, a lightening-fast sprinter, and can turn on a dime. She loves riding in the car but makes for an absolutely terrible passenger. She sits six inches from the fireplace all winter, sleeps all the way under the covers at night, and loves to eat kale (what kind of a dog loves kale?). She protects me against absolutely everyone whether I want her to or not (sigh). She can learn a new trick in a weekend or less, has never torn up a single thing in the house, ever, and has made enemies with deliverymen in more than one city. In short, she’s way more than I bargained for… and she’s everything to me. 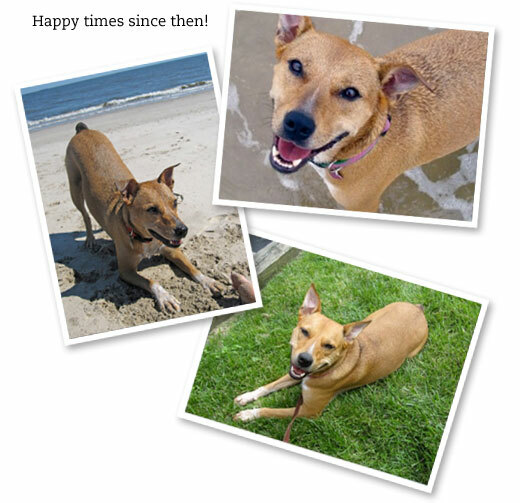 Charlotte’s birthday gift to you: Free printable adoption kits! If Charlotte could talk, she’d say: I was a shelter dog, and I’m a great dog, and I’d like to thank people who adopted other dogs like me. If you download and use this kit, thank you – from the happy dog who’s watching me type this, and from me, too. : ) And, now that I’ve talked your ear off about Charlotte, I’d love to hear about your dog! Leave a comment and tell me all about them! PS. By popular demand I’ve also added a free printable CAT adoption set! Heather - this is so sweet! It brings a tear to my eye! What an adorable dog you have! Our dog (Max) had to go live with my husband's sister when we moved to Hawaii (we were afraid he was too old to "make" the flight). This makes me want to go adopt another one! Happy birthday to Charlotte!! Heather this is one of the greatest ideas I've seen! We just finished fostering 7 little puppies who were found at four weeks old, living under a car hood in the woods. We had them for six weeks and saw them through thick and thin and just loved them to pieces... especially the one who we adopted as our own : ) I can't wait to share this with the babies new moms and dads!! Happy birthday to your beautiful Charlotte!! This kit is such a great idea and so makes me want to adopt a 6th member to our fam...for now though we're set with our 9 lb shih tzu, Melanie. Thanks for the story, Heather, I'm definitely hanging onto this for the future!! Both of our dogs are from the Humane Society - Eddie and Tootsie. They are the BEST dogs I've ever had. They're pretty low-key, never really bark and love to snuggle. Of course they hog the bed, wake up early on the weekend (before the baby) and chase any bird, squirrel or bunny in our yard:0) But, we love them!!! I'm so excited to have found this!! You are going to laugh, but I'm actually using this for my DAUGHTER'S birthday party :) She wants a puppy themed party (she is a little puppy obsessed)! For the favors, I'm giving each child a stuffed puppy. I was going to try and create my own adoption certificates, but then I found this!!! So thrilled. Thank you!!! We have 7 animals (4 cats & 3 dogs) adopted from shelters & an 8th (another cat) that found us just last month when he was is bad shape. This is an increible story of Charlotte! We drove 5 hours each way for Courtney 6 years ago when we thought Kira wasn't going to make it through the summer...she did and loved her new puppy which brought out the puppy in her (7 yrs at the time). These are adorable:) Provided me with an idea for Easter. I adore this! I am going to have to share this with my blog readers. Thank you for putting this together. I absolutely love these!!! My best friend is a sponsor for the Cocker Spaniel rescue in DFW & makes something for all of the dogs that are adopted....GREAT!!! Hi Heather - This is so perfect! My parents had to put their sweet basset hound down last week, and just adopted a rescue dog yesterday. My girls and I are going to make a little surprise celebration for "nameless new dog" today. If I get any good photos, I'd love to share this on http://doublefunparties.com this week, if it's OK by you. Thanks again! I hope the new pup is settling in, and that your parents are doing well. What a roller coaster of a week - I feel for them, in both their loss and their new happiness! You're so sweet! The little party meant the world to my mom. I'll have the photos up on Tuesday -- they aren't great; it was a pretty gloomy day. If it's OK, I'd love to include your images of the two collections -- they'll look better than my photos! Please do include my pics if they would be useful! : ) Let me know when the post is up, I'd love to share it on facebook! What a cute name for a cute little dog! : ) Thanks for sharing your story, Debbie! Oh I so absolutely just died over this. First off, Charlotte is a stunner, what a lovely lady! Both of my boys are adopted, and I was a shelter worker for six years. I blog about dogs, and absolutely promote adoption. This was such a bright spot in my day, thank you! Hi Heather! 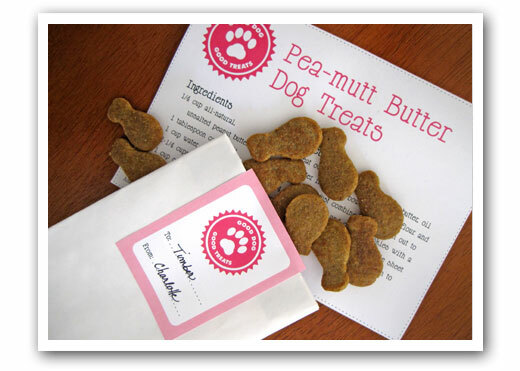 I made the Pea-Mutt Butter Treats for our English Bulldog Maggie last night and she loves them! Thanks so much for the recipe. I love this! Perfect for my daughter's 6th birthday puppy adoptathon party. Thank you! We just adopted Darcy from the pound a few days ago. I can't say enough good things about adopting. I am grinning ear to ear right now while your prints are downloading. Thank you so much for sharing. She is our first adoption and she is the sweetest best thing! Heather, I just stumbled across this and am IN LOVE! I have been in dog rescue for the past three years and this is perfect!!!! THANK YOU FOR SHARING! What a fantastic idea you adoption certificates are, my granddaughter is adopting a little dog tomorrow and this was just the kind of thing I was looking for, I want her to enjoy her little dog for the rest of it's life so I think it is important that she understands this is a real commitment, so we have drawn up a contract that has promises that she has to make to Princess Lola ( previous owner named her) and she has to sign it and agree before the adoption is finalized. Thank you so much, We will help and guide Rosie with her new life time friend and we will make sure she is a loving and understanding owner. Love these but cant get it to open. Am I doing something wrong? I click on the download link and its blank. Appreciate any help please! :) Thanks so much in advance. Hi Natalie! It should open right up when you click to download. I'll email you! Thanks for the certificates. Our Huskies Kal and Lena had six puppies. All but one are going to be rehomed ( a little sad cause we've grown so attached to them) but realistically we can't keep a total of 8 dogs especially of this breed in our city home. I wanted to include an adoption certificate for the new owners to go along with their new puppy packages when they take their bundle of fur home. Thanks for these. They are great! Hi! I am not adopting a dog, however I am throwing my daughter a "puppy party" and they are stuffing their own puppies so these are going to be perfect. Thank you so much! I love your adoption kit. I have 5 dogs, 3 from Freecycle and 2 from animal shelter. I donot need 5 dogs, but so glad to have given them a forever home. Aw : ) Isn't that how it goes? They keep finding their way home, I know! I would have a whole pack by now if Charlotte would be able to get along with other dogs in the house. But she's definitely meant to be an "only child"! These printables are perfect for my daughter's "Dog Rescue" 8th birthday party next week. The kids will each be adopting a stuffed animal puppy from our "rescue center." They'll also be making the dog treats and then we're donating the treats to our local Humane Society. Thank you so much for sharing these wonderful resources! This is great! But wheat flour is bad for dogs. They need a gluten free recipe. I wonder if you could substitute brown rice flour instead? You can, yes! Or garbanzo bean flour, that's better than rice. I wonder if you could make a similar certificate to present to the foster family? It's so rewarding to foster, knowing that the perfect home has been found for the dog! I'd love to use this certificate for the adopting family but would also love one to give to the foster family that's letting the dog go. They are truly the bridge! Oh my Heather! Charlotte is adorable!! Our stories are almost the same. I had just put in an order & was cruising your pages & saw this. My husband is a Veterinarian & we got a call a year-n-half ago from someone that told me about a puppy that was being abused by a family, including the children. She wanted to know if I would come get him if she could get to him. He would come to her house to be fed. I told her You BET I will! I jumped in my car & raced over there, praying the whole way that she could gain his trust. She did, & I finally got him to come to me after about an hour & put him in my car & took him to the clinic. His name is Bandit, this was the name the original family gave him. He's a mix of Jack Russell & maybe Yorkie/Terrier , we're not really sure. He weights 16 lbs. & now is 4 years old. I spent about 4 hours with him that night at the clinic. I wanted to bring him home with me so bad, but I already had 2 dogs here & one of them (English Bulldog) does NOT like other dogs,only Miller,(another rescue) who he grew up with. He was very aggressive with others. BTW, we tried every way we know how to stop him from being that way, but nothing worked. It broke my heart to leave him that night, but every night after that I spent EIGHT months of going to the clinic every night & spending several hours with him. During the day he was able to stay in the Secretaries office. But when she left at 5:30pm every day, I knew he would just be in a cage. The 1st day I picked him up, my husband ran bloodwork on him & we gave him his shots. We found out that he had Heartworms! They had not been giving him heartworm pills. That was Not good news. We knew it was not going to be an absolute that we could get rid of them. During the first 2 weeks, he stole my heart & everybody else that works there. We had to start the treatment & pray he would be healed. He unfortunately, had a bad reaction to the treatment & it darn near killed him, but he's s little fighter. Because of that, we had to wait several months before we could try it again but this time with some different meds to help & again praying the heartworms wouldn’t kill him before we could start them again. We were told that he was around 2 years old at that time. He had been adopted by these cruel people. The kids would pick him up & throw him on the ground. He was chained in the yard, yelled at & mistreated so badly. To this day, he's scared to be picked up & it scars him to death if somebody raises their voice. When football season was here, we would yell at the TV & he would VERY quietly ease out of the room with his tail tucked between his legs. Where my story relates to yours is, because of the heartworms, we had to get him well before we could adopt him out. We wanted to be SURE he was getting everything he needed. This process took 8 months! And during that time, one of the other Dr.'s there kept asking me, "When are you going to find him a home Charlie"? For some reason, in the back of my mind, I knew he was going to come home with me. I don't ever remember thinking that he wouldn't till he asked me that. It then hit me, I CAN"T let him go home with ANYONE else. No one would take care of him like I do. That's when I knew he had worked his way into my heart. Like you said ,"It was the best non-decision I ever made." My English Bulldog who was my baby, passed away. He was 12 years old. A few weeks after he died, I knew it was time to give Bandit a home. I had to get him out of that into a home. I was so torn up about the loss of my Bosley, but I knew I had to do something for Bandit & it was time. I was either gonna have to give him to someone else or bring him home with me. He is my shadow & my heart. He’s soooo smart & loves to watch TV. He’ll sit & watch a whole animated movie with you. lol. He’s had a ruff little life but gets spoiled rotten now. Our other sweet little rescue Miller belonged to my mother & when she passed away, we kept him. He’s a Shih Tzu/Terrier Mix & now is 14 years old. Oh, this is the sweetest story Charlie!! Thank you for sharing it with me! I got teary-eyed reading about Bandit's hard life and then the wonderful new life he has now with you. : ) Just beautiful. He won the doggie lottery when he found you and your family and my heart is just bursting to think about how happy he must be. : ) I think rescued dogs KNOW they are lucky, they really do! Thank you so much for making these, they are adorable. As a dog lover, mom to 2 rescued yorkies & a volunteer dog rescuer (through United Yorkie Rescue,) I really appreciate you posting your story & advocating for shelter dogs. If only more people would adopt from a shelter or a rescue. So many amazing dogs just waiting for a family to call their own. Thank you so much for the free things here. I LOVE LOVE the free dogie things . We have adopted two wonderful dogs from our local shelter. We had Chuck (an adorable beagle) for 12 years. We now have Buddy, approx. three years old He is a poodle/bishon/? mix. He is the MOST loveable dog we have ever owned...he is never far from my hubby or I. Can't imagine my home without a dog and there are far too may dogs in the shelter that need a home. Thank you for sharing your Charlotte with us! Hi Heather!! Loved your adoption certificates! I used them in a Pink Puppy Theme Party for my daughters 2nd birthday! Check out my blog post on it! I took in a rescued senior dog a week ago and we love her dearly. My daughter printed this for me in black and white and I came back to print it in pink for our Mattie Rose. The certificate and stickers will be used on her scrapbook page. I am going to bake the treats and use the labels to share the treats with my daughters two poodles. Thank you so much. The timing was perfect!! Thanks for these printables. We are having a puppy paw-ty for my daughter's 6th birthday. 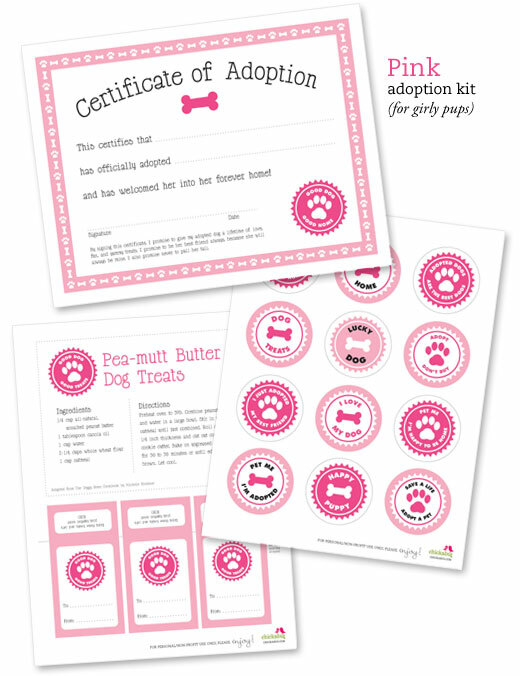 The adoption certificates are perfect for the "adopt a dog" (stuffed dog) activity at the party. The circles are perfect for the "goodie" bags. Thank You! These are sooooo cute! We are doing a dog birthday party for my 4 year old and these dog adoption certificates are perfect!!! Thanks again! As mother of 3 adopted/ rescued dogs I totally agree with you....they are the best, the more thankful and loyal puppies. Thanks for promoting shelter adoptions...please don't ever buy! ADOPT! Thank you so much for providing these print off for FREE!!!! Your puppy is so cute. We have a six month old puppy named chloe and my daughter just loves her to pieces. So for her 2nd birthday we are doing a puppy theme. These print off are perfect! Can't thank you enough! I love the adoption certificates, however I couldn't download them. Is it just me or is the freebie over? adoption kits | Chickabug” reveals the fact that you really fully understand what u r talking about! I found this on the web and it is perrfect for my daughter's 8th puppy adoption birthday party tomorrow. Though each guest is "adopting" a stuffed puppy for the party :) we are able to use your kit to make the "adoption" special for the guests. Thanks so much. Ps. : As part of the party we asked guest to bring items to be donated to our local shelter. I love the dog adoption kits! I was looking for a printable small pet adoption certificate. My daughter and I are now proud parents to a pair of female gerbils, Dusk and Dawn. The joy the little furry girls bring to my daughter is amazing. I would like to find a printable Birth/Adoption certificate that I could make for each of the Gerbils with their pictures. Do you know where I can find somethiong like this? Thank you so very much for sharing these. They are so preciously adorable (as are all of your creations!). We have four dogs of our own, two from shelters and two I literally found starving on the street, and they have brought us so much joy. Our daughter loves them so much, I know she'll love playing adopt-a-puppy with her friends! Hi! Thanks so much for allowing these to be downloaded for free!! They are awesome. My daughter Ashley is having a puppy themed party this Saturday and these are going to make her little guests (all 5/6 yr olds)squeal with glee! They each will get to pick a new stuffy/puppy at the puppy adoption center! Thanks again!! We love them! Chickabug - I am also using the adoption certificates and your kit for my daughter's 5th birthday party. We are adopting a dog in 3 weeks and she decided she wanted a puppy party. I will be doing a puppy adoption with little stuffed animals and each of the children will get an adoption certificate. I will be using the circles glued together, adding a toothpick and using them as cupcake toppers. You are wonderful for sharing these. Thanks again. Hi Adria! I'm so sorry you had trouble! I just sent you an email with the certificates attached. Please let me know if there is anything else I can do and I'll be happy to help! Fantastic! I am the Placement Coordinator for a non profit here in Colorado Springs. I was looking for a nice way to finish off an adoption of one of our wonderful rescues and I thought a certificate would do it. What a great surprise to find exactly what I was looking for all ready to go. Thanks much! (once approved by our board, I hope this will give us the added touch we need to finalize such an important event). Aw, Charlotte is beautiful! It's always great to see a pup happy in their home with their people! thank you for the printables, my grandson who's almost 2 loves dogs and we are doing his theme in puppy's . Hello Heather! This was a great idea and very cute! I volunteer (and will soon be an employee :)) at a shelter and was wondering if you would mind if I used these downloads for some of our adoptions? Hi Meghan! Absolutely!! I would be DELIGHTED if you would use them for your adoptions, or any other way you like : ) Thank you for asking! This is some of the cutest stuff I've ever seen!! I'm an event coordinator for my local animal shelter and I just LOVE these! I want to include them with all our adoptions :D !! Thank you.......your site is exactly what I was looking for. These are beautiful. Is there any chance to modify this so we could use this for "virtual adoptions" when people sponsor a pet? So the words would mention that they have sponsored a pet rather than adopted a pet? We have a birthday party for my son that we are holding at the local animal shelter to support their animals on Aug 1 and we would love to use certificates that are as beautiful as yours!!! Is this download available in yellow and grey? Hi Angela! It is available in pink and blue as shown. Great Website will be back! LOVE LOVE LOVE THE PET ADOPTION KITS! WILL BE USING FOR MY DAUGHTER'S PUPPY PARTY! THANK YOU! i adopted my baby girl kenzy from the aspca in Dallas and she has been one of the best pups in the world! she is spoiled rotten and she knows it. adoption is always the best because these baby's need us. they have been abandoned or worse has happened. All they want is love and attention. so if you are thinking about getting a pup or any kind of animal please let adoption be the first! Love these! I rescue and will be using! I have 4 baby girl puppies. Thank you. I love this idea for an adoption kit! I actually found my cat as a stray and she is super sweet, so I'm a huge fan of adopting from shelters over breeders! I linked to your site and gave full credit. Let me know if you would like me to change anything or remove anything. This is actually for my grandsons birthday party...Puppy Dog theme...I have stuffed puppy dogs for party favors...this is gonna be perfect for the party !!! These are adorable! My 6yo daughter is having her bday party at an adoption shelter. As the party favor the kids will be able to adopt a (stuffed) cat or dog. This is so perfect, thank you for sharing! We have four adopted pets; 2 dogs and 2 cats. Yay Forever Homes! Thank you for this! I adopted my siberian husky and love him to death! Thank you for making this a free printable! My daughter who is turning 8 absolutely loves our Boxer and wants a puppy party for her birthday. We will definitely be using these! Hi. I was wondering if you could send me this adoption kit by mail? I dont have a printer and the library charges too much for print outs. I would be so grateful. Anyway, my address is *******. God blessyou and all your furry friends! Hi Tina, I'm very sorry, that's not something I can help you with. Thank you so much for the free Adopt a Cat printable!! My daughter is so excited to use these for her birthday party! Are you interested in revising this adoption paperwork to accomodate my 7 year old's dolphin-themed birthday party? If so, please contact me at your convenience. Thank you so much. I have not received your email to be able to download these! Hi Donna! Please be sure to check your spam folder. The email will be from shop@chickabug.com. Thanks! Hi Kira! Please follow the instructions in the welcome email by signing in at this page. Click on the words "PINK" or "BLUE" under the dog adoption kits. Thanks! This is Awesome! The kids are going to LOVE it! Hi Brittany! There are instructions at the bottom of the post. I love this. Thank you so much. I want to use it for my daughters birthday but Im struggling to download the dog adoption certificate. Could you please help me? Hi Cecile! Please follow the instructions in your VIP List welcome email. Just click on the link and enter the password provided. Thanks! thank you for the adoption kit! Hi there! I love your stuff! Im having a Paw Patrol party for my son who will be turning 3 and I thought the adoption center would be a great party favor! Is it possible to get the template? Hi Shanda! You can download the adoption certificates by following the directions in the post. Thank you! Puppy adoption kit is perfect for my daughter's party! My friend has had her dog taken away from her so i want to surprise her with a gift. I really love this idea!! Than k you for sharing!! Hi Jessica, I’ve manually added you to the VIP List. Please check your email for a message from shop (at) chickabug.com. Thanks! Could you please send it again? I didn't get it. Thanks so much! Excited about the adoption certificate! Love this idea for my daughter's birth day party! Thank you for the printables, I do a lot of emergency need private foster and this is so helpful! I would like to use this idea for my client's sons birthday party. we are doing the paw patrol theme and I think this would be perfect!! Hello! I love this idea, I am not able to download either. Can you please send me a copy? Still waiting for my link please!! Hi Nikki! When you joined the VIP list you got a message from shop(at)chickabug.com. Look for that or search “Chickabug” in your email and it will come up. The email has the link to the free downloads. I hope this helps! I would like girl puppy adoption please. Why cant i download free dog adoption certificate? Hi Jess! When you joined the VIP list you got a message from shop(at)chickabug.com. Look for that or search “Chickabug” in your email and it will come up. The email has the link to the free downloads. I hope this helps! Thank you for these adorable adoption certificates! My daughter and her friends will love it!! I have joined your VIP, entered the password and I still can not download the pet adoption kit in pink. Help! cute ideas! I have a chocolate lab who is 14 years old. We love her so much! She has brought so much joy to our family! Thanks for the great ideas! We have a 2 yr old Bernese Mountain Dog who is the sweetest dog ever! This 120 lb "lap dog" loves us unconditionally and we couldn't be more blessed to have her in our home. My daughter is turning 7 in a few weeks and all she wants to do for her birthday is have a puppy party with her friends. I would love to use these adoption papers for the party to give away a puppy stuffy! Thank you for offering this I breed Great Pyrenees and I really wanted each of their adoptions to be extra special. Thanks for adoption certificates! I am using them for my kindergarten classroom! I do have a poodle that I rescued 11 years ago! I have a Grand baby who has a birthday coming up. I have rescued my two furbabies and this will be our theme, adoption of furbabies. I will make sock puppies of various types and will let the guests Adopt them. Start them out young and show them the importance of sharing your love for animals and keeping them safe. Adoption is the best breed! i love this sooooo much but cant seem to figure out how to get it..... i'd pay a ton for this if i could!!!! Hi Kristy! Looks like you got the email, opened it, and clicked on the link, so you should be ok. If not, please let me know. Thanks! How do you print the pet adoption certificate? My email address has already been sent to be a VIP member, but it keeps taking me to the same page. Hi Jen! Looks like you opened the email and clicked on it after sending this message, so you should be ok. If not, please let me know. Thanks! I would like access to the free downloads, please. Hi Brandi, Instructions for getting them are under "HOW TO DOWNLOAD" in the post above. I added you to the list. Thanks! i have been trying to download the adoption papers , put the password, got the vip but i don't seem to get anywhere. i am doing a fundraiser for the azhumaine society and thought these would be great. please help. I just came across your certificate packs and I think it's a fantastic Idea. My pure breed Siberian Huskies Maya and Max had a litter of 7 stunning puppies. 4 boys and 3 girls. I would love to print these packs out and hand them to the new puppy parents with all of the information of each puppy along with their vet check certificate and certificates of health. I will let you know what they think of the gesture. I have 5 dogs 2 Cats and 2 Ferrets yes a zoo but they are my babies and so spoiled I have Remington who is a 3yr old Chihuahua mix and he is my spoiled stalker. He goes where I go or he acts like he is abused if I leave him. I have Big Show also a Chihuahua mix who is my sons baby and he really acts like a baby and gives hugs. Princess another chihuahua and she is just the lady of the house. I have Bubba my red heeler who is my old man. He blind and is so lovable he will pet himself if you let him. Last dog but not least is Kyah my Shepard mix who adopted us. She just showed up one day and never left. I have the two cats Powder and Patches who are brothers. They are the best mousers in the world. They are super smart and never needed a litter box because they house trained themselves to go out side like the dogs. My ferrets Phynius and Harleigh are my little guys. They think they are ten foot tall and bullet proof when it comes to the dogs. The dogs know not to touch them because they will stand up and show them who is boss. Thank you so very much!! These are beautiful!! This is so cool! I'd love to print these out and use them if I worked at a shelter or something. It'd be neat if you could also put a picture of a dog somewhere on the certificate, though I suppose "real" certificates don't usually have photos on them... but still... with a picture of the dog on it it'd make for an even cuter thing to frame and hang. Hello, I've been trying for 2 days now to receive these downloads and for some reason, they're not coming through to my email. I have checked all folders.